Office: Mon - Fri 8am to 5pm, Closed Saturday and Sunday. Prime, Tack & Seal Co. maintains an inventory of state inspected emulsions at our West Chicago, Illinois location. We have nine storage tanks with a total capacity of 93,000 gallons, with each tank dedicated to hold a specific product. Eight tanks are heated by a hot-oil heating system. Emulsions are water-based materials and are considered to be nonhazardous and environmentally friendly. PTS applies emulsions to existing asphalt or concrete surfaces and new construction sites prior to asphalt paving. Applications for chip & seal in addition to aggregate slope paving also are treated with emulsions. An application of a diluted asphalt emulsion to penetrate an absorbent surface. It is used to prepare an untreated granular base for an asphalt surface. The prime penetrates into the base and plugs the voids, hardens the top and helps bind it to the overlying asphalt course. A very light spray application of diluted asphalt emulsion used to insure a bond between the asphalt overlay being placed and the existing surface. A single surface treatment involves spraying an asphalt emulsion and immediately spreading and rolling a thin aggregate cover. For multiple surface treatments, the process is repeated a second or even third time with the aggregate size becoming smaller with each application. 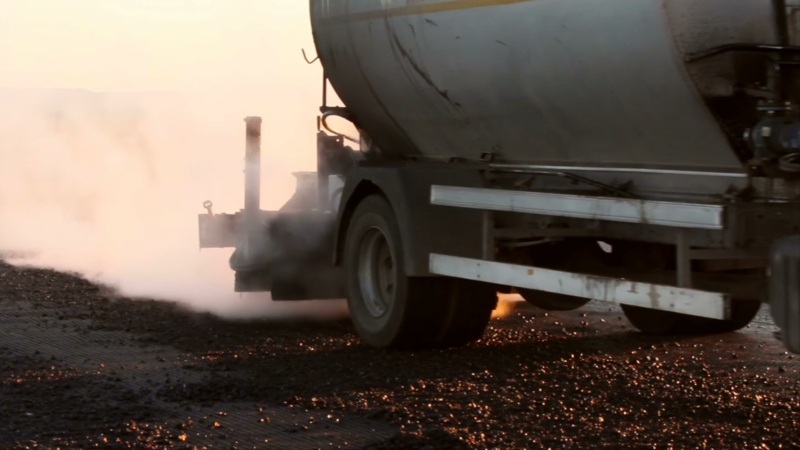 Applying an application of asphalt emulsion to an aggregate embankment uniformly over the surface to ensure penetration and binding of the particles in the upper 2 inches of the aggregate blanket. A practical and low-cost solution to controlling dust problems on unpaved roads, driveways and parking lots in quarries, lumber yards, railroad yards, construction sites, fairgrounds, horse arenas and parks, to name a few. LJS, also known as a void reducing asphalt membrane (VRAM), is a thick membrane applied as an overlay to the joint formed between two paving passes, after air and water has caused damage and a widening gap to form over time. The overlay bonds to existing pavement, reduces air and water permeability, and stops further separation and crack formation. Don’t see your application listed here? Contact us for more information about your specific needs! © 2019 Prime, Tack and Seal Co.